A delivery system for various functional compounds is disclosed. The delivery system incorporates a composition containing alumina. Various functional materials containing particular moieties may be adsorbed onto the alumina and used as desired. The functional compounds can be, for instance, pharmaceuticals, xenobiotics, anti-microbial agents, anti-viral agents, UV absorbers, odor control agents, fragrances, and the like. In one particular embodiment, for instance, certain dyes can be adsorbed onto the alumina surfaces. Once the dye is adsorbed onto the alumina surface, the resulting particles can be combined with a liquid vehicle for use in any suitable printing process. A delivery system generally refers to a system that aids or otherwise facilitates the delivery of a functional material to a desired location. The functional material can be any material that acts upon a substrate or otherwise provides a benefit once delivered to the desired location. Examples of functional materials that may benefit from the use of a delivery system include pharmaceuticals that are intended to be ingested or subcutaneously injected into a patient, fragrances, vitamins and nutrients, and various other and numerous additives. In one particular application, for instance, the functional material can be a dye that is intended to be printed or otherwise applied to a substrate. In the past, various delivery systems for dyes have been proposed that are intended to facilitate application of the dye to a substrate, such as a textile material. The delivery systems, for instance, are intended to affix the dye to a substrate, prevent the dye from fading when exposed to sunlight, to prevent the dye from degrading when exposed to the environment, to facilitate application of the dye to the substrate, or, for example, to render the dye more stable. Even in view of recent advances in the art, further improvements in delivery systems for functional materials are still needed. For example, a need currently exists for a delivery system that can bind to various functional materials that does not incorporate relatively expensive chemical formulations or that does not require any complex process steps for incorporating a functional material into the delivery system. With respect to dyes, a need also exists in the art for a delivery system for a dye that is capable of affixing the dye to negatively charged surfaces. For example, a need currently exists for a delivery system for dyes that is capable of affixing the dyes to textile materials containing natural or synthetic polymeric fibers that have a negative surface charge. The present invention is generally directed to a delivery system for various functional materials. The functional materials can be, for instance, colorants, UV absorbers, pharmaceuticals, odor control agents, fragrances, anti-microbial agents, anti-viral agents, antibiotics, xenobiotics, nutriceutical agents, and the like. In accordance with the present invention, the functional materials are adsorbed onto alumina that is contained in a particle. The resulting particle can then be used as is or can be combined with a vehicle, such as a liquid vehicle, to deliver the functional material to a desired location. For example, when the functional material is a colorant, the particles of the present invention can be incorporated into a liquid vehicle and applied to a substrate using any conventional printing means. a tautomer thereof, or a functional equivalent thereof and wherein R and R′ comprise independently hydrogen, an alkyl group, or an aryl group. The above moieties can be present as is on a functional compound. Alternatively, however, each of the above moieties can include further R groups attached to the carbon chain shown above. In general, any such R group can appear in association with the above moieties as long as the R group does not interfere with the bonding of the moiety to an alumina. The above moieties have been found to form a bond with alumina in constructing the compositions of the present invention. Of particular significance, it was discovered that the functional compound, in some embodiments, can bond with alumina without significantly changing the positive charge character of alumina. For example, under certain conditions, alumina may have a positive surface charge. It has been discovered that even after the functional material is bonded to the alumina, the resulting structure still maintains a positive charge. Thus, in one embodiment of the present invention, positively charged particles are formed. Due to their positive charge, the particles may be securely affixed to the surface of a substrate that carries with it a negative charge through coulombic attraction. In one particular embodiment of the present invention, novel recording mediums, inks, and nanoparticles containing a colorant compound may be formed. In accordance with the present invention, such recording mediums, when applied to substrates, exhibit improved water and detergent resistance. For example, the delivery system of the present invention can improve the durability performance of the recording mediums especially to substrates having a negative charge. For instance, in one embodiment, a recording medium such as an ink-jet ink, can be produced according to the present invention that is substantive to substrates containing synthetic polymeric fibers, such as polypropylene fibers, polyethylene fibers, polyester fibers, and the like. Other features and aspects of the present invention are discussed in greater detail. In general, the present invention is directed to a delivery system for functional compounds. Functional compounds can be any suitable substance that can provide a benefit to a location once delivered. In accordance with the present invention, the delivery system is generally directed to the construction of a particle containing alumina. The alumina contained within the particle provides a bonding site on the surface of the particle for a functional compound. Specifically, the functional compound becomes adsorbed onto the surface of the alumina. Once the functional compound is bonded to the alumina, the resulting particle can then be used to deliver the functional compound to a particular location. The particles can be used as is, for instance, or can be combined with a liquid vehicle which may facilitate delivery of the particles depending upon the particular application. a tautomer thereof, or a functional equivalent thereof and wherein R and R′ comprise independently hydrogen, an alkyl group, or an aryl group. As used herein, a functional equivalent to one of the above moieties refers to functional materials that include similar reactive groups as shown above, but which are not positioned on a molecule as exactly shown above and yet will still bond with alumina in a similar manner. 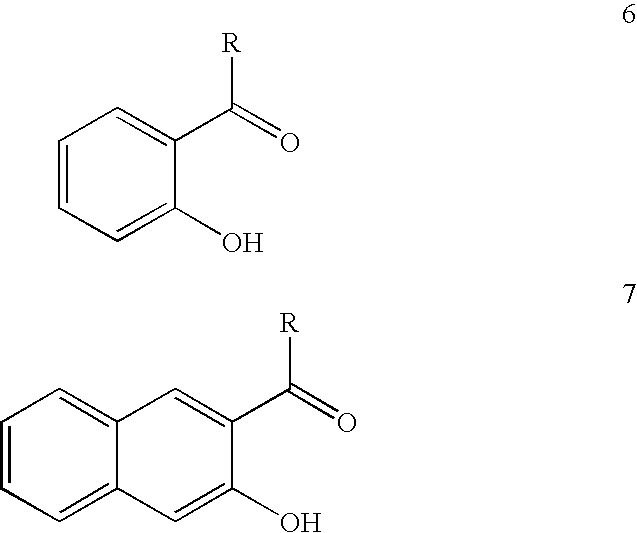 Referring to the moieties shown above, moiety (1) may be considered a carboxy-hydroxy moiety. Moiety (2) may be considered a hyrdoxy-hydroxy moiety, while moiety (3) may be considered a carboxy-carboxy moiety. Moieties (4) and (5), on the other hand, can be considered vinylalogous amide moieties. In moieties (4) and (5) above, the amine groups can be primary amines, secondary amines, or tertiary amines. In general, any suitable functional compound containing one of the above moieties or a functional equivalent thereof may be used in accordance with the present invention. Further, it should be understood that various additional R groups may be included with the above moieties as long as the R groups do not interfere with the bond that is formed with alumina. The present inventors have discovered that the above moieties may form a relatively strong bond to an alumina surface. The functional compounds may be bonded to the alumina surface in order to change the properties of the resulting particle or to perform a particular function. Without wishing to be bound by theory, it is believed that the above moieties form a bidentate ligand bonding system with alumina surfaces. For instance, it is believed that alumina forms a covalent bond and a coordinate bond with the above moieties. Further, it is believed that a surface reaction occurs causing the functional compound to remain on the surface of the particle and form a coating thereon. The functional material can cover the entire resulting particle or can be located at particular locations on the particle. Further, it should be understood that the particles of the present invention can contain more than one functional compound. Of particular advantage, in many embodiments, it has also been discovered that a functional compound can be bonded to alumina without significantly impacting on the positive surface charge of alumina, which can be measured as zeta potential. The term “zeta potential” is used herein to mean without limitation a potential gradient that arises across an interface. This term especially refers to the potential gradient that arises across the interface between the boundary layer in contact with the particle of the present invention and the diffuse layer surrounding the particle. Zeta potential measurements can be taken using, for instance, a Zetapals instrument which are available from the Brookhaven Instrument Corporation of Holtsville, N.Y. For example, zeta potential measurements can be conducted by adding one to three drops of a sample into a cuvet containing 1 mM KCl solution, using the instrument's default functions preset for aqueous solutions. Thus, once alumina is bonded to the functional material, the resulting molecule continues to maintain a relatively strong positive charge. For instance, particles made according to the present invention can have a zeta potential of greater than 20 mV, particularly greater than 30 mV, and, in some embodiments, greater than 40 mV. By remaining positively charged, the particles are well suited for being affixed to substrates that carry a negative surface charge through coulombic attraction. Depending upon the difference in charge between the particle of the present invention and the surface of a substrate, the bond in some applications can be relatively permanent and substantive. Consequently, the delivery system of the present invention can be used to affix functional compounds to various substrates without the use of chemical binders or other attachment structures. Various different particles and compositions can be used in the present invention that contain alumina. For example, in one embodiment, the functional material is combined with an alumina sol. Many different types of alumina sols are commercially available with varying particle size. Of particular advantage, alumina sols can be prepared that carry a relatively strong positive surface charge or zeta potential. In this embodiment, the particle that is reacted with the functional compound contains primarily and in some embodiments exclusively alumina. In other embodiments, however, the particle reacted with the functional compound can contain various other ingredients. In general, the particle can contain any material that does not adversely interfere with ability of the functional material to bond to alumina. In this regard, at least a portion of the alumina contained within the particle should be present on the surface of the particle so that the alumina is available for adsorbing the functional compound. In one particular embodiment of the present invention, the particle can contain a core material coated with alumina. The alumina can form a continuous coating over the particle or a discontinuous coating. The core material can be, for instance, an inorganic oxide, such as silica. For example, in one embodiment, sols can be used that contain silica nanoparticles that have an alumina surface coating. Such sols are currently commercially available, for instance, from Nissan Chemical America of Houston, Tex. The silica is coated with alumina to provide stability to the sols over certain pH ranges. In fact, alumina coated silica sols may have greater stability in some applications of the present invention in comparison to alumina sols. As described above, any suitable functional compound containing one of the above moieties, a tautomer thereof, or a functional equivalent thereof may be used in accordance with the present invention. Examples of functional compounds include pharmaceuticals, and xenobiotics. Xenobiotics is a general term used to describe any chemical interacting with an organism that does not occur in the normal metabolic pathways of that organism. Other functional compounds can include UV absorbers, odor control agents, fragrances, therapeutic agents, nutriceutical agents, anti-viral agents, anti-microbial agents, and the like. One example of a therapeutic agent that may be used in the present invention is hydrocortisone. Examples of nutriceutical agents include ascorbic acid and aspartame. In one particular embodiment, the functional compound may be tetracycline, which is a known antibacterial agent. In still another embodiment of the present invention, the functional compound can be a colorant, such as dye. Particular examples of dyes that may be used in accordance with the present invention are discussed in greater detail below. Once any of the above-mentioned functional compounds are bound to alumina, the alumina acts as a delivery vehicle for delivering the functional compound to a desired location. Once bound to the alumina, the functional compounds may be easier to handle, may be more stable, or may have other improved properties depending upon the application. Further, the resulting alumina structure can be incorporated into various other mediums. For instance, the alumina structure can be incorporated into liquid vehicles, can be formed into capsules, can be combined with gels, pastes, other solid materials, and the like. The particles formed according to the present invention containing alumina and the functional compound can be present in various forms, shapes, and sizes depending upon the desired result. For instance, the particles can be of any shape, for example, a sphere, a crystal, a rod, a disk, a tube, or a string of particles. The size of the particle can also vary dramatically. For instance, in one embodiment, the particles can have an average dimension of less than about 1 mm, particularly less than about 500 microns, and more particularly less than about 100 microns. In other embodiments, however, even smaller sizes may be desired. For instance, the particles can have an average diameter of less than about 1,000 nm, and particularly less than about 500 nm. As used herein, the average dimension of a particle refers to the average length, width, height, or diameter of a particle. As described above, the particles of the present invention include a surface layer that contains one or more functional compounds. The coating on the particle can be continuous or discontinuous. The particle itself is amorphous. In one particular embodiment, the present invention is directed to a delivery system for dyes. In particular, it has been discovered that the use of alumina as described above provides various advantages and benefits when attempting to apply a dye to a substrate. For instance, it has been discovered that the alumina delivery system can provide a means to make permanent prints onto substrates having negatively charged surfaces, such as substrates containing thermoplastic polymers as well as natural fibers. The ink becomes affixed to the substrate at relatively low cost and low complexity without the use of chemical binders and without the use of a pre-treatment or post-treatment process on the substrate. For example, once a dye is adsorbed onto alumina in accordance with the present invention, for many applications, the resulting particle has a positive charge. Thus, the particle can be affixed to negatively charged surfaces through coulombic attraction. Depending upon the charge difference between the particles and the substrate, the dye may exhibit permanent properties such as wash fastness by being resilient to water and detergents. For example, generally wash fastness can be obtained if the charge difference between the substrate and the particle is greater than about 42 mV. In general, any dye containing a carbonyl-hydroxy moiety, a hydroxy-hydroxy moiety, a carbonyl-carbonyl moiety, a vinylalagous amide moiety, a tautomer thereof, or a functional equivalent thereof as described above may be used in the process of the present invention. Various examples of dyes that may be adsorbed onto alumina are as follows. It should be understood, however, that the below list is not exhaustive and is not intended as limiting the invention. Numbers indicate the substitution positions of the anthraquinone structure. This table indicates dye substituents that occur at positions 1, 4, 5, or 8 on the anthraquinone structure. In other words, this table shows the presence of groups that form alumina bonding moieties 1 through 5. 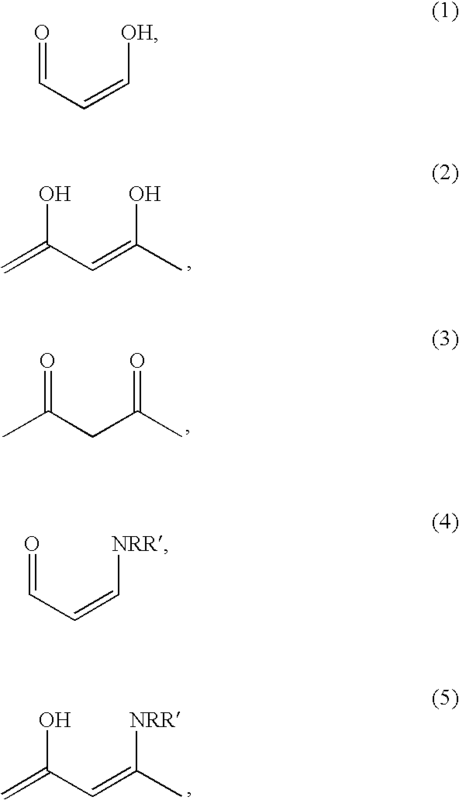 Dyes containing salicylate (6, R═OH), Salicamide (6, R═NH2, NHAr, NHAIk), or BON acid (3-hydroxy-2-naphthoic acid) (7, R═OH) or a nitrogenous BON acid derivative (7, R═NH2, NHAr, NHAIk) moiety as shown below may also be used in accordance with the present invention. These dyes often fall into the Colour Index Mordant application class. Dyes based upon Chronotropic acid 8 are also substantive to alumina. Azo dyes are formed when chronotropic acid is reacted with a diazonium salt. Azo coupling occurs at positions 2 and/or 7. Dyes containing acetoacetanilide moieties 9 also contain the correct geometry to bond to alumina. 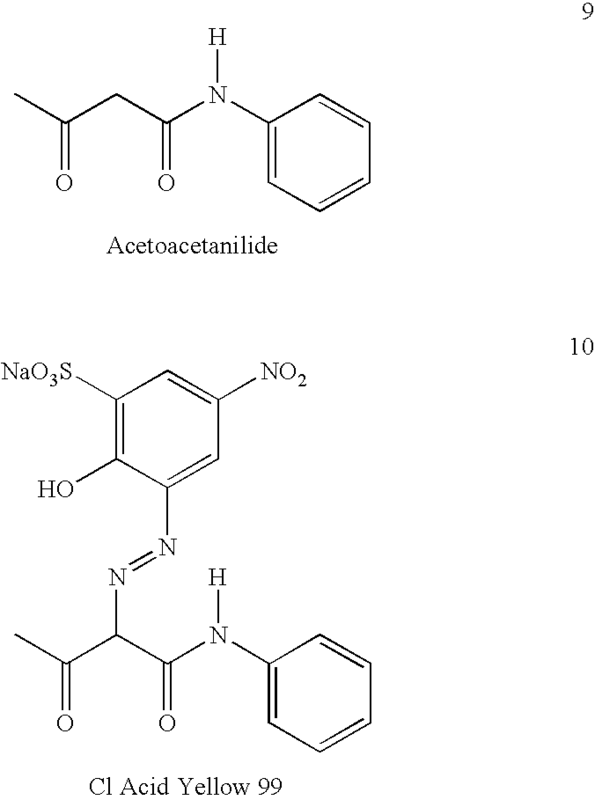 Azo dyes couple to acetoacetanilide beta to the two carboxyl groups. An example is CI Acid Yellow 99, 10. Acetoacetanilide will adsorb onto the surface of alumina. CI Natural Black 1 (Hematoxylin) is another example of a dye that contains quinoid groups and is substantive to alumina. Aluminum Dyes; Dyes Known to be Useful for Staining Anodized Aluminum. There are several dyes that are know to be useful for the coloration of anodized aluminum, including CI Mordant Red 7 (Eriochrome Red B), 12. It is believed that the geometry of the five membered pyrazolone ring oxygen atom brings it into the correct position with the beta-naphthol group for complexation with alumina. 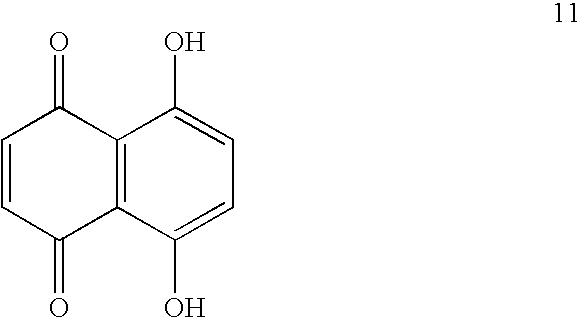 Thus, the following structure can be considered a functional equivalent to a carbonyl-hydroxy moiety. The structure also contains an iminalogous amide moiety, which is functionally equivalent to a vinalogous amide. Certain anionic dyes may be precipitated using certain metal ions to form an insoluble colored compounds know as Lake Pigments. For example, Erythrosine (Tetraiodofluorescein) forms an insoluble salt with aluminum ions. The salt is known as CI Pigment Red 172. In addition to a dye as described above, in some embodiments, it may be desirable to bond other functional compounds or additives to the alumina. For instance, additives that assist in the dyeing process or that stabilize the dye may also be bonded to the alumina if the additive contains a moiety as described above. Such functional additives that may be used include charge carriers, thermal oxidation stabilizers, crosslinking agents, plasticizers, a charge control additive, a flow control additive, a filler, a surfactant, a chelating agent, a colorant stabilizer, or a combination thereof. Various methods can be utilized to construct dye particles in accordance with the present invention that contain a dye adsorbed onto alumina. For instance, in some applications, the alumina and the dye containing a reactive moiety can be combined and reacted in an aqueous solution. In some embodiments, however, the dye may be difficult to dissolve in water. In this embodiment, the dye can first be dissolved in a minimum quantity of a solvent. The solvent can be, for instance, acetone, ethanol or a similar liquid that is miscible with water. After the dye is combined with the solvent, if desired, a surfactant can be added in an amount greater than about 0% to about 50% by weight of dye solids added. In general, the amount of surfactant added to the solvent should be minimized. One suitable surfactant that can be used, for instance, is SURFYNOL 440 surfactant sold by Air Products and Chemicals, Inc. located in Allentown, Pa.
With rapid stirring, the dissolved dye solution can then be added to a dilute aqueous suspension that contains particles comprising alumina. Although not critical, better results may be achieved if the aqueous suspension is slightly heated. After constant stirring for a sufficient amount of time, the dye disperses by precipitation throughout the mixture and slowly dissolves into the water. Once dissolved into the water, the dye can be adsorbed by the alumina contained in the particles. Once the dye is adsorbed onto the alumina, the resulting particles can be used to formulate a suitable colorant composition for use in various processes, such as in a suitable printing process. The colorant composition may comprise an aqueous or non-aqueous medium, although an aqueous medium is useful for applications which employ liquid printing mediums. The colorant compositions of the present invention contain particles, as well as, desirable colorant stabilizers and additives. For example, the colorant composition may contain the above-described particles in combination with any of the following additives: a second colorant; a colorant stabilizer, such as a porphine; a molecular includant; a pre-polymer; and any additional components as described above. The present invention encompasses recording mediums such as ink jet inks comprising the nanoparticles disclosed herein. Inks used in ink jet printers are described in U.S. Pat. No. 5,681,380, assigned to Kimberly-Clark Worldwide, Inc., which is incorporated herein by reference in its entirety. Ink jet inks will usually contain water as the principal solvent, preferably deionized water in a range of between about 20 to about 95 percent by weight, various co-solvents in an amount of between about 0.5 and about 20 percent by weight, and the particles of the present invention. Various co-solvents may also be included in the ink formulation. Examples of such co-solvents include a lactam such as N-methylpyrrolidone. However, other examples of optional co-solvents include N-methylacetamide, N-methylmorpholine-N-oxide, N,N-dimethylacetamide, N-methyl formamide, propyleneglycol-monomethylether, tetramethylene sulfone, and tripropyleneglycolmonomethylether. Still other solvents which may be used include propylene glycol and triethanolamine (TEA). If an acetamide-based cosolvent is also included in the formulation it is typically present at about 5 percent by weight, within a range of between about 1.0-12 percent by weight. Optionally, one or more humectants in an amount between about 0.5 and 20 percent by weight may be included in the ink formula. Additional humectants for optional use in the formulation include, but are not limited to, ethylene glycol, diethylene glycol, glycerine, and polyethylene glycol 200, 400, and 600, propane 1,3 diol, other glycols, a propyleneglycolmonomethyl ether, such as Dowand PM (Gallade Chemical Inc., Santa Ana, Calif.), polyhydric alcohols, or combinations thereof. 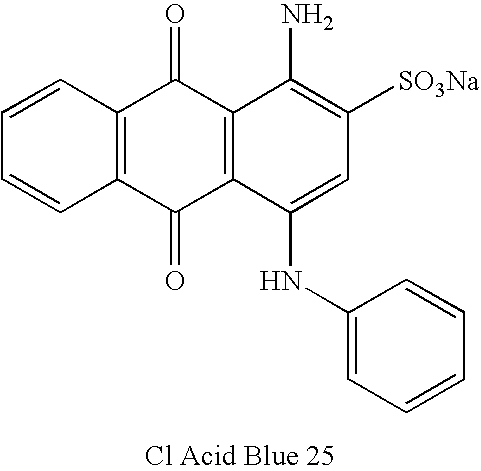 Other additives may also be included to improve ink performance, such as a chelating agent to sequester metal ions that could become involved in chemical reactions that could spoil the ink over time, for example for use with metal complex dyes, a corrosion inhibitor to help protect metal components of the printer or ink delivery system, a biocide or biostat to control unwanted bacterial, fungal, or yeast growth in the ink, and a surfactant to adjust the ink surface tension. However, the use of a surfactant may be dependent on the type of printhead to be used. If a surfactant is included, it is typically present in an amount of between about 0.1 to about 1.0 percent by weight. If a corrosion inhibitor is included, it is typically present in an amount between about 0.1 and about 1.0 percent by weight. If a biocide or biostat is included, it is typically present in an amount between about 0.1 and about 0.5 percent by weight. If a biocide or biostat is added to the ink formulation, it may be exemplified by Proxel GXL (Zeneca Corporation, Wilmington, Del.). Other examples include Bioban DXN (Angus Chemical Company, Buffalo Grove, Ill.). If a corrosion inhibitor is added to the formulation, it may be exemplified by Cobratec (PMC Specialty Group Distributing of Cincinnati, Ohio). Alternate corrosion inhibitors include sodium nitrite, triethanolamine phosphate, and n-acyl sarcosine. Still other examples include benzotriazole (Aldrich Chemical Company, Milwaukee, Wis.). If a surfactant is included in the formulation, it is typically a nonionic surfactant exemplified by Surfynol 504 (Air Products and Chemicals, Inc., Allentown, Pa.). Still other examples include Surfynol 465, and Dynol 604 also available from Air Products. If a chelating agent is included in the formulation it may be exemplified by an ethylene diaminetetraacetic acid (EDTA). Other additives such as pH stabilizers/buffers, (such as citric acid and acetic acid as well as alkali metal salts derived therefrom), viscosity modifiers, and defoaming agents such as Surfynol DF-65, may also be included in the formulation, depending on the product application. Depending upon how the colorant composition is formulated, the composition can be used in various printing processes. For instance, in addition to ink jet printing and other non-impact printers, the colorant composition can be used in screen printing processes, offset lithographic processes, flexographic printing processes, rotogravure printing processes, and the like. In some of the above printing processes, a thickener may need to be added to the colorant composition. The thickener can be, for instance, an alginate. The recording medium or colorant composition of the present invention may be applied to any substrate to impart a color to the substrate. The substrate to which the composition is applied may include, but is not limited to, paper, wood, a wood product or composite, woven fabrics, non-woven fabrics, textiles, films, plastics, glass, metal, human skin, animal skin, leather and the like. In one aspect, the colorant composition or recording medium may be applied to textile articles such as clothing. In one particular embodiment, a colorant composition containing particles of the present invention may be applied to a substrate having a negative surface charge. As described above, the alumina contained in the particles of the present invention retain a positive charge even after adsorption of a dye. Consequently, the particles remain affixed to negatively charged surfaces. In fact, wash durability of the colorant composition may occur if there is a substantial amount of charge difference between the substrate and the particles of the present invention. In view of the above, colorant compositions made according to the present invention are particularly well suited to being applied to natural and synthetic substrates that have a negative surface charge. For instance, naturally occurring materials that generally contain a negative surface charge include cotton fibers, cellulose fibers, and substrates made therefrom. Such substrates include all types of fabrics, garments and apparel, paper products, and the like. In addition to the above natural materials, in one particular embodiment, colorant compositions made according to the present invention have been found to be well suited to being applied to substrates made from synthetic polymers, such as thermoplastic polymers. Such substrates can include, for instance, woven and non-woven materials made from a polyolefin polymer such as polypropylene or polyethylene, polyester, and the like. In the past, various problems have been experienced in trying to affix dyes to these types of materials. Consequently, either complicated dye structures have been used or dyes and or pigments have been applied in conjunction with chemical binders. The particles of the present invention, however, can permanently affix to these materials without the use of chemical binders or complex chemical constructions. Although not needed, in some embodiments it may be desirable to pre-treat or post-treat the polymer substrates which may further serve to affix the dyes to the materials. For instance, substrates made from synthetic polymers can undergo a pretreatment process for increasing the negative surface charge. For example, such pretreatment processes include subjecting the substrate to a corona treatment or to an electret treatment. An electret treatment, for instance, is disclosed in U.S. Pat. No. 5,964,926 to Cohen, which is incorporated herein by reference in its entirety. Such pretreatments have been found not only to increase the negative surface charge of polymeric materials, but also assist in wetting out the polymer and enhancing surface adhesion between the polymer and the particles of the present invention. In addition to pretreatment processes, substrates contacted with the particles of the present invention can also undergo various post treatment processes which further serve to affix the particles to the substrate. For example, in one embodiment, the treated substrate can be subjected to radio frequency radiation or to microwave radiation. Alumina is known to adsorb radio frequency radiation and microwave radiation causing the particles to heat. Once heated, it is believed that the particles become further embedded into the polymeric substrate. Further, the particles can be heated without also heating the substrate to higher than desired temperatures. The present invention may be better understood with respect to the following examples. As shown above, the positively charged alumina was capable of adsorbing carminic acid without going through a charge reversal step. Aluminasol 200 (Nissan Chemical America, 2 g) was diluted with DI water (98 g) with good stirring. Carminic acid (Aldrich, #22, 925-3) (0.5011 g) was suspended in DI water (23.7135 g) with good stirring. The carminic acid did not dissolve completely at this concentration, and so whenever portions were taken, they were taken while stirring vigorously so that suspended solids were also withdrawn. A hypodermic syringe was used to withdraw 1 ml of carminic acid suspension. This was added to the diluted Aluminasol 200 with good stirring. The suspension changed from a white to a bluish red. This mixture was allowed to stir overnight. The next morning, all dye had dissolved, and no dye crystals were observed. 0.2008 g CI Acid Blue 25 (Aldrich) was added to 19.7735 g DI water and stirred to give a suspension, which was stirred for 30 minutes. 1 ml of this was added to a mixture containing 2 g Aluminasol and 98 g DI water. Mixture stirred overnight to ensure that all dye had dissolved. 0.2507 g of CI Acid Blue 45 (Aldrich) was suspended in 20.1751 g DI water with stirring for 30 minutes. 1 ml (syringe) was added to a mixture of 2 g Aluminasol and 98 g of DI water to give a blue complex. Mixture stirred overnight to ensure that all dye dissolved. In the following sample, a high concentration of Aluminasol 200 was combined with carminic acid. Specifically, 0.111 g glacial acetic acid (Fischer, ACS plus reagent grade) was diluted with 29.795 g DI water. This was added to 49.941 g of Aluminasol 200, slowly with good stirring. This mixture was stirred for 20 mins, at which point, 4 ml (measured using a syringe) of a suspension of carminic acid in DI water (0.5011 g carminic acid in 23.7135 g water) was added at once, with good stirring. Mixture stirred overnight. A fourth sample was then constructed containing the same ingredients (carminic acid) in the same amounts as listed in Example 2 above. The above three solutions were then subjected to a dialysis test to demonstrate that the dye was adsorbed onto the alumina surfaces. Specifically, the three solutions were dialyzed against 3% glacial acetic acid using Sigma Dialysis Tubing (Cellulose, 12,000 mw cut off, Sigma D-0655. Tubing was soaked in DI water for two hours prior to use to remove glycerine, and to make the tubing flexible.) As a control, a small amount of carminic acid was added to a dialysis tubing and placed in a bath containing 3% acetic acid. Within 2 hours, carminic acid had traversed the cellulose membrane and had colored the 3% acetic acid solution. No color was observed from the aluminasol mixtures, suggesting, along with the color change, that the colorant was strongly sorbed by the particles. The next morning, the 50% aluminasol/carminic acid solution had colored the water bluish red. However, it is believed that the bag had ruptured. 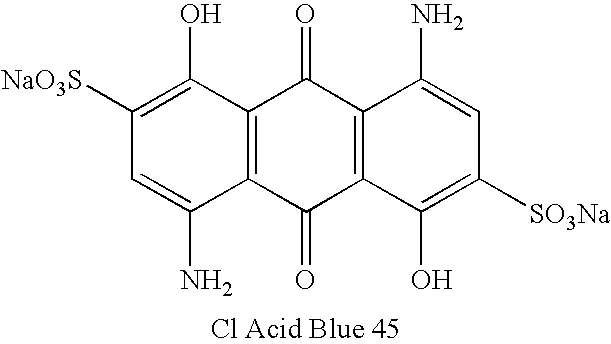 Also, a very faint, almost indiscernible blue coloration was noticed in the dialysis solution of the aluminasol acid blue 45 dialysis, suggesting that this colorant did not as strongly adsorb into the alumina. The following tests were conducted to demonstrate the washfastness of the particles of the present invention on cotton. The three compositions prepared in Example 3 above containing 2% aluminasol/Acid Blue 45; 2% aluminasol/carminic acid, and 50% aluminasol/carminic acid were spotted onto cotton poplin fabric (0.01198 g/cm2, from Yuhan-Kimberly, uncoated) and dried overnight at 60° C. As the aluminasol containing mixtures were dropped onto the cotton, it was observed that only the flooded area of the fabric took up color. Colorless water wicked out from around the spotted area suggesting that i) no unadsorbed dye was present in the mixture, and ii) the nanoparticles sorbed onto the cotton, and were immobilized. A control sample was also prepared. 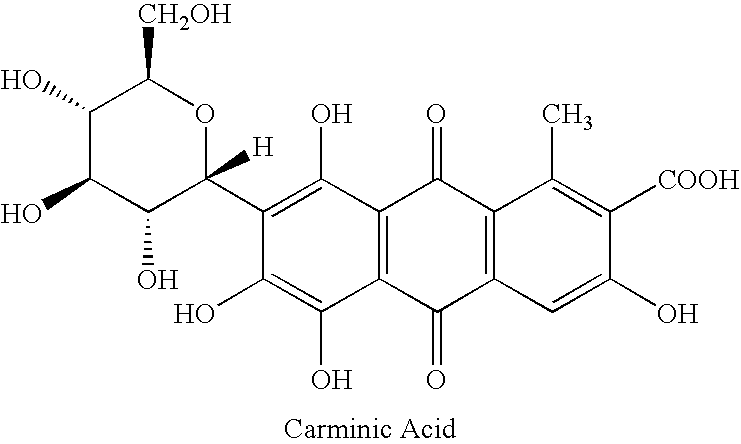 In particular, a carminic acid solution was first formulated containing 0.5011 grams of carminic acid in 23.7135 grams of DI water. The carminic acid solution was dropped onto cotton poplin fabric using a pipette and allowed to dry overnight at 60° C.
Samples were washed by i) rinsing under a hot running tap, and then by stirring for 2 hours in 2 liters of water containing 1 g/liter Aerosol OT (dioctyl sodium sulfosuccinate surfactant obtained from Cytec Industries of West Patterson, N.J.) and 1 g/liter of sodium bicarbonate, with stirring (mechanical paddle stirrer). Samples were entered into the washing bath at 60° C., and the bath cooled over two hours to 30° C. The fabric was rinsed in cold water, then dried in the air at ambient. The Carminic acid of the control sample rinsed out of the cotton. Almost all of the dye/Aluminasol complex remained as a bluish-red stain. The following tests were conducted to demonstrate the washfastness of particles made according to the present invention on a polypropylene non-woven spunbond fabric. The spunbond fabric tested had a basis weight of 2 osy. Polypropylene spunbond was smeared with i) carminic acid, ii) the concentrated 50% Aluminasol/carminic acid complex suspension prepared in Example 3 and iii) the 2% Aluminasol/carminic acid complex suspension prepared in Example 3. In all cases, the polypropylene was difficult to wet out with these materials, and so smearing was required using a rubber-gloved finger and the teat pipette used to apply the liquids. Once the material had been smeared on forcibly, the material showed little retraction. The samples were allowed to dry overnight at 60° C.
i) Carminic acid of the control sample rinsed out of the PP. ii) Some, but not all of the aluminasol/carminic acid inks were retained on the polypropylene. The nature of the washing out was not a general fading of the area. However, there appeared to be a loss of all material from certain areas, but not others. In other words, it looked as though the ink had not wet out the polypropylene. iii) Considerably more aluminasol/carminic acid was retained on samples that were microwaved prior to washing. It is thought that the microwave treatment may have heated the colored particles, allowing them to embed in the polypropylene. Microwaving for longer time did not considerably improve the washfastness of the prints. In this example, instead of using an alumina sol, a sol containing silica particles that had an alumina surface coating were used. The surface coated silica suspension was obtained from Nissan Chemical America of Houston, Tex. The suspension is sold under the trade name SNOWTEX-AK. 50 ml of 20% wt/wt suspension of SNOWTEX-AK (Nissan Chemical America, Houston, Tex.) was stirred at ambient temperature while 0.2 grams of carminic acid dye (Aldrich Chemical Company, Milwaukee, Wis.) was added. Stirring was continued overnight and resulted in a dramatic color change from blood red to blue/purple. SNOWTEX-AK-Size: 62 nm and Zeta Potential: +36 mV. SNOWTEX-AK with carminic acid-Size: 83 nm and Zeta Potential: +35 mV. The bond formation of the aluminum-dye complex did not result in a change in zeta potential. The above “ink” solution was applied to 4″×4″ pieces of untreated cotton fabric and allowed to air-dry. A similar control sample was constructed using only carminic acid. The dried fabrics were then subjected to a washing cycle in 2 litres of water containing Ajax liquid detergent and sodium bicarbonate at 60° C. for 2 hours. The fabric samples were then air-dried. The SNOWTEX-AK/carminic acid sample did not loose any color after the washing cycle. In contrast, the control sample (a sample stained with 0.2 g Carminic Acid in 50 ml water, dried under the same conditions) lost all of the color upon washing under the same conditions. The following example demonstrates the application of the present invention to other functional compounds as opposed to dyes. The UV-visible absorbance spectrum of Tetracycline was measured using a UV-visible spectrophotometer (Perkin-Elmer UV-Visible spectrophotometer.) Tetracycline was found to absorb at 357 nm in water. When SNOWTEX AK suspension (as described in Example 6) was added to the tetracycline solution, a bathochromic shift occurred to give an absorbance of 365 nm, suggesting that the tetracycline had adsorbed onto the alumina surface of SNOWTEX AK particles. 109. The article of claim 108, wherein the particles comprise a core material coated with alumina. 110. The article of claim 109, wherein the core material comprises silica. 111. The article of claim 108, wherein the functional compound comprises a colorant, a UV absorber, a pharmaceutical, an odor control agent, a fragrance, a therapeutic agent, a nutriceutical agent, an anti-bacterial agent, an anti-microbial agent, an anti-viral agent, a xenobiotic, or combinations thereof. 112. The article of claim 108, wherein the functional compound comprises hydrocortisone, ascorbic acid, aspartame, a cyclomycin, tetracycline, or a combination thereof. 113. The article of claim 108, wherein the particles are contained within a liquid vehicle when applied to the fibrous material. 114. The article of claim 108, wherein the functional compound comprises a dye. 115. The article of claim 114, wherein the dye contains an anthraquinone chromophore, salicylate or 3-hydroxy-2-naphthoic acid moieties, acetoacetanilide, naphthoquinone, mordant dye, or a combination thereof. 116. The article of claim 114, wherein the dye is based on chromotropic acid. or a tautomer of this moiety. wherein R and R′ are hydrogen. 120. The article of claim 108, wherein the particles have an average dimension of less than about 1,000 nanometers. 121. The article of claim 108, wherein the particles have an average dimension of less than about 500 nanometers. 122. The article of claim 108, wherein the cellulose fibers are naturally occurring. 123. The article of claim 108, wherein the receiving surface of the fibrous material and the particles have a surface charge difference of at least about 20 mV. 124. The article of claim 108, wherein the receiving surface of the fibrous material and the particles have a surface charge difference of at least about 42 mV. DE3135025A1 (en) 1981-09-04 1983-03-24 Collo Gmbh A method of producing a sorptive body, especially for odor removal, an air-freshener, etc..